this was a live performance with audiovisuals and spoken word. sound was looping on jeskola buzz. 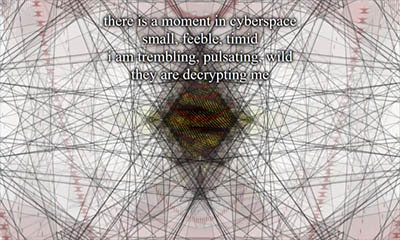 visuals were displayed in browser canvas fullscreen. people could connect to special network and url and they would get assigned a parameter which would control something from the audio or visuals. Still, as an idea it was pretty cool. interesting concept, i hope people will pick it up and develop further! I liked the idea, even tho i didn't managed to run it.